John Byrne, David Hockney and more feature in this colourful exploration of Bill Hardie’s influential life in art. Gallery: A Life in Art is an autobiography by William Hardie, who handled thousands of pictures as a leading art dealer over a 50 year period. Here we explore his influential connection to two key artists – John Byrne and David Hockney. Earlier, we had shown John Byrne’s drawings for the TV drama series Tutti Frutti. Concurrently with the Hunter show, a little exhibition of Byrne’s drawings for his television series Your Cheatin’ Heart occupied the small gallery. John, with his customary attention to every detail no matter how minute, had drawn the protagonists of his drama in character and in costume. The drawings functioned both as storyboard and as illustrations for the book which accompanied the series, which was produced and brilliantly cast by John. The show gave career-defining roles to Emma Thompson, Richard Wilson and Robbie Coltrane and several other actors. Robbie Coltrane opened the show with a practised speech. Later, on a visit to his house outside Glasgow, I admired his collection of 1950s American automobiles which were in keeping with his kingsize frame. […] John Byrne had recently mentioned watercolours painted by himself, and my expectations were high when he telephoned to say that he had an exhibition ready for me. So I was puzzled when three tea chests containing John’s collection of silk handkerchiefs arrived at the gallery. ‘Where’s the show?’ quoth I. ‘In the boxes’. ‘Are they watercolours?’ ‘No, hankies’. ‘What’s the show called?’ ‘Hankies’. John then spent three days mostly recumbent on the gallery floor collaging the hankies into miraculously meaningful, decorative and even beautiful compositions, which were pressed behind plexiglass in frames. Again, they were bought in large numbers by his eager fans, and although neither of us became millionaires as a result, it was enormous fun to do this gloriously cheeky show. I realized later that the handkerchiefs hadn’t as it were come from nowhere, apart from John’s secret hanky drawer and his favourite junk shop. There had been an earlier group of oil paintings, ostensibly self-portraits, which had featured forms broken up – that is too strong an expression, better might be ‘folded’ or ‘streamed’ – into shapes resembling scarves, pashminas, shawls, throws, chadors: the right word eludes me. At that time I went to virtually every opera at Theatre Royal. Sometime in 1992 John Cox was asked by Covent Garden to produce Die Frau Ohne Schatten, composed by Richard Strauss. He engaged David Hockney again to design the sets and costumes, and began to commute to Los Angeles for conferences with Hockney and with the late Peter Hemmings, the very English head of the Los Angeles Opera Company. Since Cox over the years had urged me to do a show with David Hockney, I half in jest said to him on the eve of one of these visits, ‘Can I come too?’ To my considerable surprise he agreed. So it was ultimately Richard Strauss and Mozart who were responsible for our exhibition of new paintings by David Hockney. Because of its location, the Beverly Hills Hotel, where Hockney had actually painted the wave pattern on the floor of the pool, was ruled out. As the purpose of all my visits to LA was to stick as close as I dared to David Hockney until he agreed to do the show with us, Sunset Boulevard at La Cienaga was an ideal location, near the artist’s house up in the Hollywood Hills. When nothing in particular was happening, the art museums were easily reached by car: the Getty at Malibu, the Norton Simon at Santa Monica, the LA County Museum of Art on Wilshire at Venice, and The Huntington Library and Art Collections (home of Gainsborough’s The Blue Boy) in Pasadena. One day I drove up the Pacific Coast Highway to Bakersfield to see the 1,000 giant orange umbrellas planted by Christo across many acres of Magic Mountain. This huge installation had to be seen from a car. On my first morning in California I found myself breakfasting on the terrace of the Mondrian Hotel on Sunset Boulevard with John Cox’s brother, the sculptor Stephen Cox, who was also staying in the hotel, and whom I was meeting for the first time. We were joined at table by Liz Lopresti, who introduced herself as a psychologist who counselled the astronaut Buzz Aldrin. Even in Los Angeles it is a trifle unusual to meet someone who knows a man who has walked on the Moon. (I once saw the first man on the Moon, Neil Armstrong, emerging from St Giles Cathedral in Edinburgh surrounded by photographers.) Liz took us on a tour of LA. Stephen and I went for a swim in the ocean, with the jets from LAX thundering overhead every other minute. The Mondrian Hotel was David’s suggestion. It was modernist pastiche painted red, yellow and black in the style of the abstract painter Piet Mondrian and by the architect J.L. Sert. The hotel had 1930s decor, all chrome, black glass and mirrors, a stunning view over the city below to the ocean, and a very LA clientele: the elevator would either disgorge soberly suited Silicon Valley executives, or people in sneakers, shorts and t-shirts ready for the beach; one never knew which it was going to be. But the swimming pool was tiny. The current Hockney swimming pool (which is not the one in the early paintings) beckoned from Hollywood Hills, and thither Stephen and I took a taxi with a Mexican driver who had no English and didn’t have a clue where he was going, finally arriving at David Hockney’s house late. John Cox, who had been at the Hockney compound for a week, did the introductions. David was affable but abstracted. He was focused on the opera design, and seemed to have little interest at that stage in my proposed exhibition. The visitors had a swim and lunch, after which David fell asleep. Waiting by a pool fringed with palm trees for the phone to ring is an essential part of the Hollywood experience. Especially if one is trying to persuade a very famous artist to agree to an exhibition. 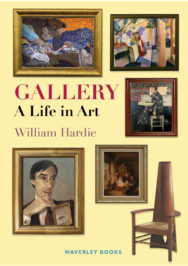 Gallery: A Life In Art by William Hardie is out now published by Waverley Books priced £14.99.